That has to be the approach for Raleigh Ring of Fire. Ring reached the semifinal for the third straight year after ousting Austin Doublewide in quarters. Every time, San Francisco Revolver has been standing in their way. The previous two meetings ended in Revolver’s favor. In 2016, San Francisco edged Raleigh 13-12. The 2017 edition was slightly more comfortable with a 13-10 finish. Revolver looks just as talented as ever. The reigning champions have two different Player Of The Year (POTY) candidates in Grant Lindsley and Ashlin Joye. San Francisco may not have won the U.S. Open or Pro Championships, but it did emerge victorious at WUCC in July. The semifinal finish at U.S. Open is the worst finish of the season for Revolver. Even without a signature tournament win this year, there is a target on its back. Ring can counter with plenty of offensive firepower. 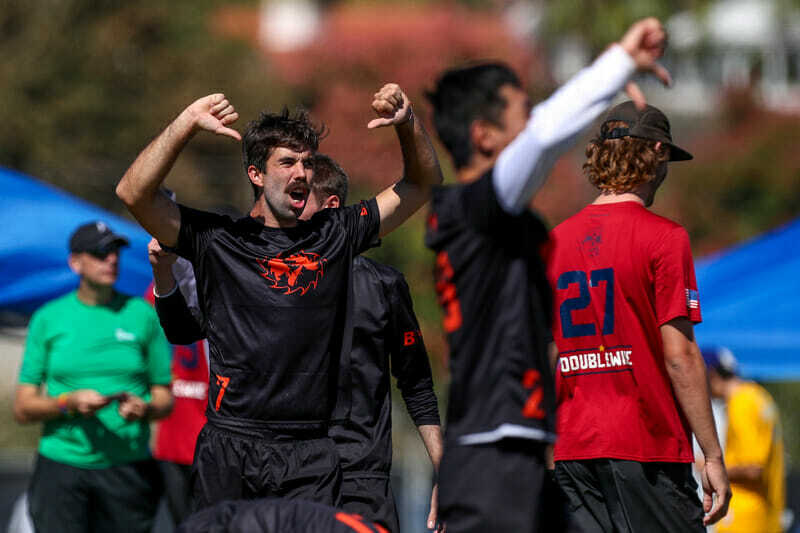 Nethercutt is in the POTY conversation and Jack Williams might be close to playing his way into that spot as well after some clutch performances so far at nationals. Both teams enter playing some of their best ultimate of the tournament. Revolver pulled away late against Truck Stop in its quarterfinal. After Truck pushed the game to 12-11, San Francisco flipped a switch and closed the contest in dominating fashion, 15-11. Ring took pretty much the same path, leading 11-10 before scoring three straight for a win over Doublewide in its quarter. One of the keys to this game will be Ring’s ability to frustrate the Revolver offense. PoNY laid out the blueprint in the Pro Championship final, consistently poaching the lane and cutting off offensive flow leading into some uncharacteristic throwaways. Raleigh coach Mike Denardis is known to be particularly crafty with unique defensive looks and it wouldn’t be a surprise to see him do it again. For Revolver, the biggest challenge will be preventing deep shots without much help defense. Players like Mischa Freystaetter and Henry Fisher tower over most players who matchup with them. San Francisco is reluctant to drop players off to help over the top. Listed at 6’7″ and 6’6″ respectively, Freystaetter and Fisher are both taller than any player on San Francisco. Raleigh likes to throw both players on together to create some chaos. Freystaetter is quite literally the biggest difference in this year’s matchup as this is first season on Ring. On top of Freystaetter’s presence, last year’s matchup was significantly impacted by the weather, with windy conditions clearly slowing down Revolver’s offensive flow. Raleigh broke to start the game as a result. With winds only expected to reach about 11 mph tomorrow as opposed to the gusty conditions of Sarasota, junky zones will not be as effective of a tactic for either team. Based on successes from last season, Ring will need to prevent deep looks from Revolver. San Francisco struggled in the red zone to convert and presented Raleigh with plenty of opportunities for both breaks and second chance offensive points. There is no disputing Ring is a top team in the division, but Raleigh has definitely flown under the radar so far in this nationals tournament. Between the late-game comebacks for PoNY, lopsided mixed bracket and upsets in the women’s division, there has not been much room for Ring’s tournament performance to take center stage. Mentally, it will be a hurdle for Raleigh to beat San Francisco. It will not be enough to play well, but miss a few opportunities. Stanley put it well following Truck’s loss. Historically, San Francisco only elevates its level of play as the number of teams remaining in the bracket shrinks. Revolver has won five titles since 2010. Ring on the other hand has struggled, reaching the finals only once back in 2002 despite reaching the semis five times since then. In the end, it will be logged as yet another chapter in this storied showdown with the winning team earning a chance at a national title. Comments on "Magic Number Three? Revolver And Ring Meet For Third Straight Semifinal"